Most radio systems in operation today in Canada are grandfathered analog systems, and that’s a problem for most users. Day in and day out we hear from customers that are experiencing a number of issues with their current radio systems. Whether it’s static or interference on their channel, poor range, problems with durability for work conditions, little or no safety features, or radios that don’t operate for a full shift because the battery dies – issues like these cause frustration, lost time, increase costs and, in the worst case, major safety issues for your team. This is the number one concern we hear from customers in the manufacturing, construction, emergency services and oil and gas industries. These customers work in some of the noisiest environments, whether it’s tools, equipment, or machines running around them, they need clear communications with their team at all times. 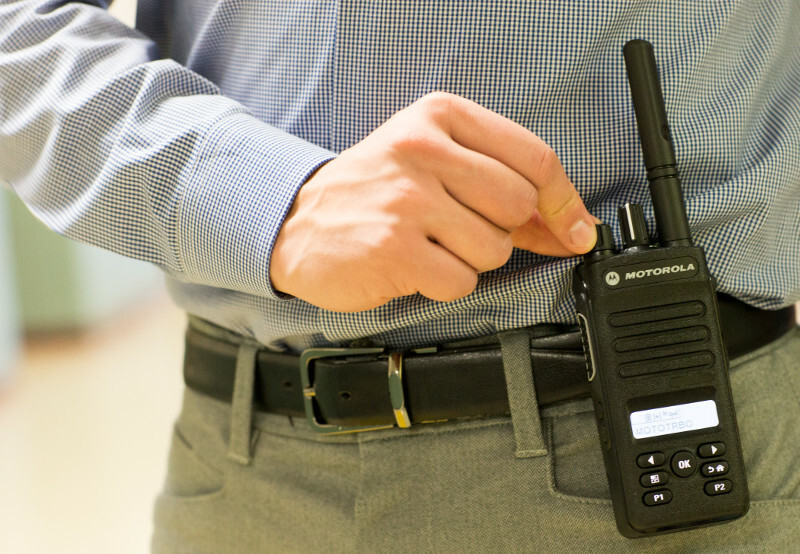 Solution – With Motorola’s Intelligent Audio feature, new MotoTRBO digital radios will automatically adjust volume levels of the radio up or down in response to the noise level in the work environment. Motorola digital radios have a feature called background noise suppression that automatically blocks out noise around the radio, so the radio transmission is sent clearly and loud every time. Also, with the full range of speaker microphones and industrial headsets by Peltor, no message should ever be missed. We hear from customers daily that have complaints about poor range of their current radio system. This issue happens for customers that are working in vehicles that travel around their business area, but also happens for customers that are operating in a building like property management companies, hotels, or warehouses. With poor coverage issues, calls are lost, time is wasted and users of the radios are frustrated that they aren’t able to do their job. Solution – Motorola digital radios operating in digital mode on average extend range 30 to 40 per cent more than similar analog radios. This helps reduce missed communications on the fringe of coverage, keeps your team connected, and helps everyone to do their job and have successful outcomes. In larger operations this is a very common concern. Radio systems are generally a shared resource among a number of teams and operational areas of the business. Everyone wants to do the job as efficiently as possible, and not being able to communicate with your team causes backups, slowdowns, and frustration. Solution – MotoTRBO digital radio systems have twice the capacity of standard analog systems. This means more staff can be communicating, working and focusing on the job they are doing rather than being blocked out on the radio. Nothing is more frustrating for your staff than working away, and the battery on their radio dies. Everything stops while they go back and replace the battery. This sometimes doesn’t just hold up one team member, but could stop your whole team from completing the job they are working on. Solution – With Motorola IMPRES battery technology, batteries last much longer while in use daily. Recently released batteries can work over 24 hours on a single charge. Also with IMPRES batteries, customers have been able to save over 40% on replacement batteries. Who’s boss wouldn’t like to be saving money in an investment? Whether you’re working in a facility in an urban centre, or in an isolated location, you need to know you can rely on your communication device to work in all conditions – you work long, tough days, and your two way radio should, too. Solution – With the MotoTRBO line of two way radios, you know you’re getting a technology that is built to withstand what you put it through. From drops and vibrations, to dust and even water immersion, the Motorola options can really tick any and all boxes you can throw its way. As Motorola has worked with customers like you, they have come to realize that not everyone who uses a two way radio has the ability to carry larger options throughout the work day. In a number of customer facing industries, for example, a compact communication device is often more than efficient for team communications. Today’s options are no longer a one size fits all. Solution – The MotoTRBO line of two way radios has every shape and size option for your team and will work for every worker – not every industry requires the same specifications in a radio, but that’s okay. These Motorola digital radios come in everything from small and compact (the size of a smartphone) to radios for the most rugged of users. Without communication, there is no safety. Having the right communication can mean noticing the difference between “fix it” and “it’s fixed” – crucial words in certain work environments. Safety is a growing concern in a number of industries, and for obvious reasons. Solution – Digital two way radios offer more than just communication. In fact, they take safety to a whole new level with better range and noise cancellation features, along with better clarity than you thought possible. They’re also built tough – and can work through cold temperatures and weather conditions. Not only will your team be safer, but ultimately more efficient and productive because communication will not lessen as they work throughout the day. Investing in new technology can be daunting for any budget, especially when it comes to replacing an entire fleet. Solution – There are two way radios available for every price point – and you may be surprised at the ability to afford them. There are definitely added advantages to the choice, as well – including the fact that the MotoTRBO line of Motorola two way radios, for example, is slated to last from five to seven years (much more than investing in a cell phone). Other advantages? The fact that a number of newer two way radios are able to work with each other, and with older fleets (including in analog). This makes the transition easy when you’re ready to switch out the whole fleet. We deal with inquiries and these concerns from our customers on a daily basis. Having been in the business for more than 30 years, we understand that every business is different, and we want to work with you to help you learn how working with this technology can make your work life easier. 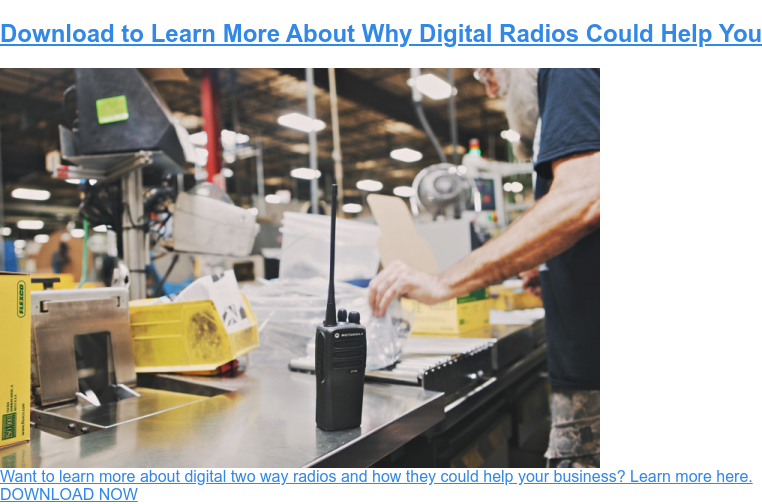 These are just a sample of the advantages to digital radio systems from MotoTRBO. We have a vast knowledge base of how each product can benefit your industry, so contact one of our two way radio experts today for more information. Want to find out more about the advantages of digital two way radios? Click below!